iTunes backup files. Support iOS 10 and iPhone 7/7 Plus. transfer data between Android and iPhone directly. between different iPhone and Android Phone. Manage your phone data on computer using iPhone SMS/MMS Backup & Restore, Android SMS/MMS Backup & Restore, iPhone WhatsApp Backup & Restore, Android WhatsApp Backup & Restore, iPhone Viber Transfer,Android Viber Transfer and more. 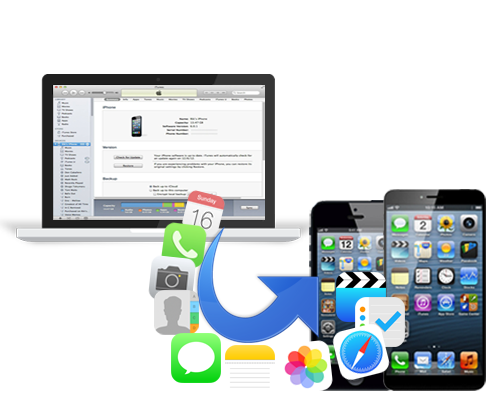 Copy data from Android to iPhone smoothly with our Android SMS/MMS to iPhone Transfer, Android Data to iPhone Transfer, Android WhatsApp to iPhone Transfer, Android Viber to iPhone Transfer and more. 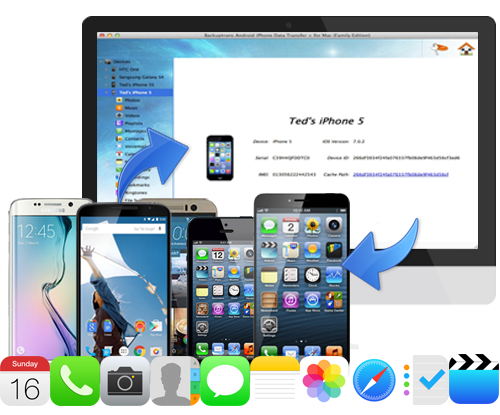 Migrate data from iPhone to an Android Phone easily by iPhone SMS/MMS to Android Transfer, iPhone Data to Android Transfer, iPhone WhatsApp to Android Transfer, iPhone Viber to Android Transfer and more. A real way to recover deleted SMS & MMS & iMessage back to your iPhone. No other recovery utility software can do this. If you have two Android/iPhone devices or one Android and one iPhone, it's always wise to find a tool to help you manage Messages(SMS & MMS) for your Android/iPhone devices or to transfer SMS & MMS messages between Android and iPhone. Backuptrans Android iPhone SMS/MMS Transfer + is the best all-in-one messages manager package which lets you copy & share SMS, MMS for Android/iPhone on computer directly. No Root/Jailbreak required. 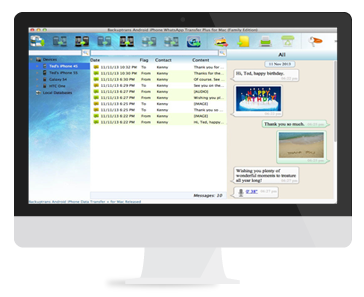 Backup Restore and Transfer Line chat messages for iPhone. Backuptrans WhatsApp Transfer are updated to support WhatsApp 2.11.444. Backuptrans software are supported to support Android M now. How to transfer Viber messages from Android to iPhone? 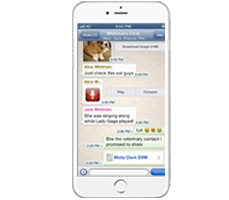 How to transfer WhatsApp messages between iPhones? Backuptrans software are 100% clean and safe. Please download the latest version software from our official website. It is illegal to use cracked software and keygen. Please purchase a license online and get 24/7 support. I usually do not take the time to review what I've bought, but this is a perfect program that deserves praise. It can do much more than I've expected, such as restoring my sms back to my iPhone without jeakbreaking. Thank you for creating such smart and innovative sms transfer software. I'm both an android and iPhone user. I was wondering if I could directly transfer whatsapp messages from my android to my iPhone 5S until I found your software. The only solution I could find available in the markert. Really saved my life. I expecially love its user-friendly design. Keep up the good work. I was very impressed with your software. It was straight forward to transfer from my Android to IOS Apple. Just want to make the point that your software has a distinct advantage over other products available in that the SMS messages are placed in the correct place on the new phone as if they were originally created on that phone. I liked the courtesy follow up email as well. Well done.